Before these disappear from my phone album I thought I’d share because there are some amazing pieces. 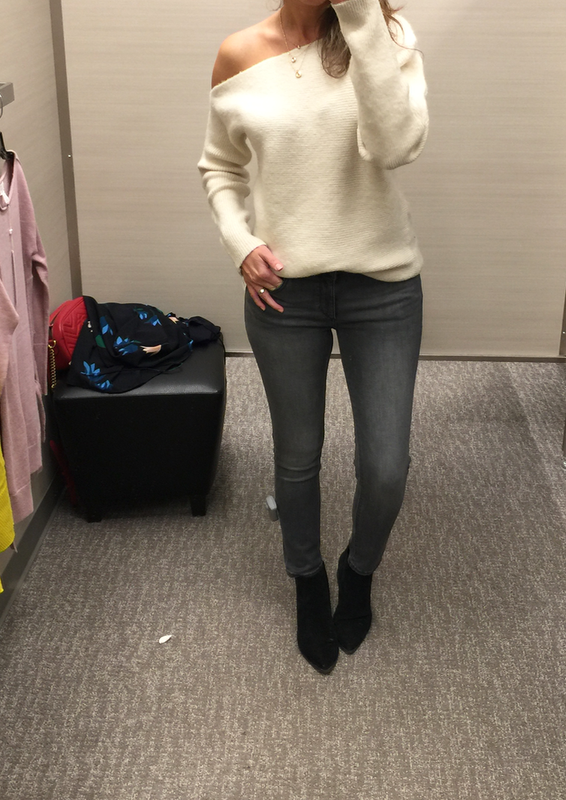 Finally tried on a pair of DL1961 jeans – super soft and stretchy, on the pricey side though (didn’t love the slightly wide hem in this pair). Loved the color though! Wish I had grabbed a different pair just to compare as I think I could have sized down. But I’m a sucker for a soft, well fitted pair of jeans. Like this style better. The side tie was a nice detail, love the length. It comes in more colors. 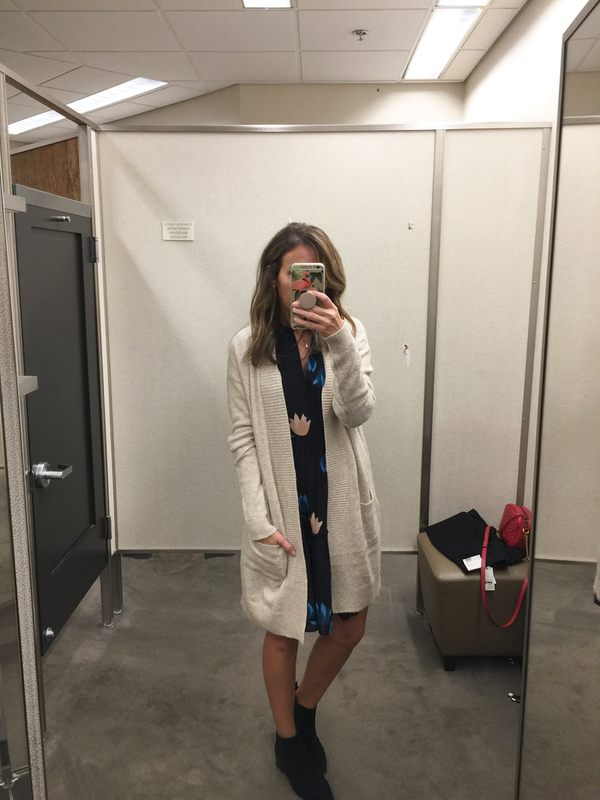 I loved the length of this cardigan, the pockets the color…I just wasn’t feeling the drape-y part. 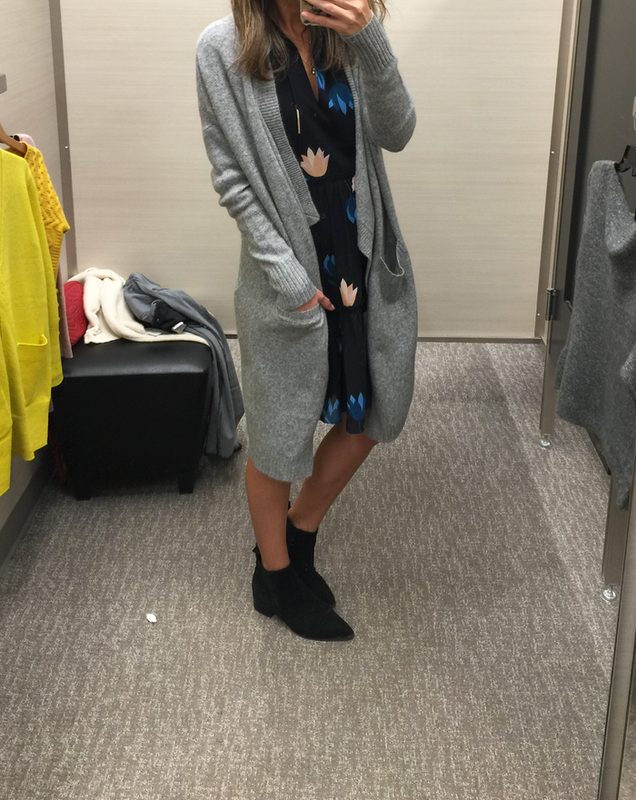 Cardigan – loved the bright color. The length was good, fit was slightly meh (I’m liking this one more). 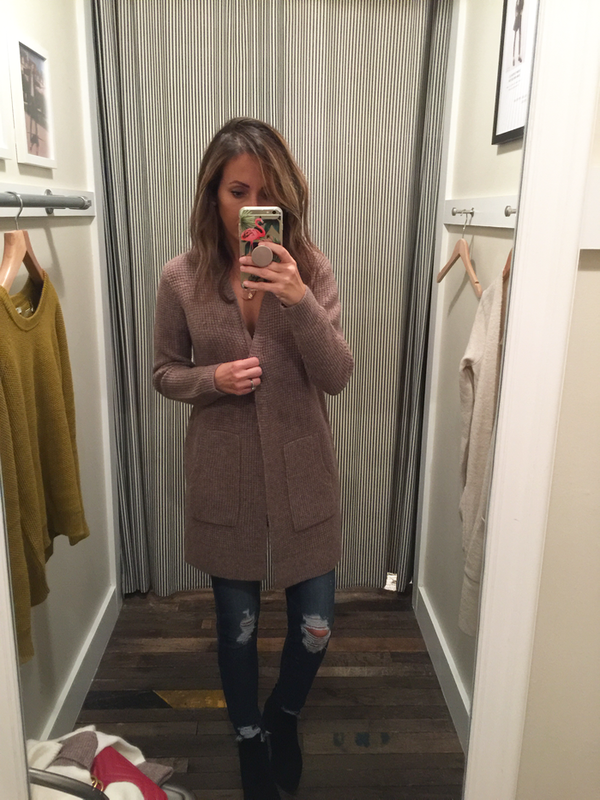 Just a nice basic cardigan – $49 (in xs). 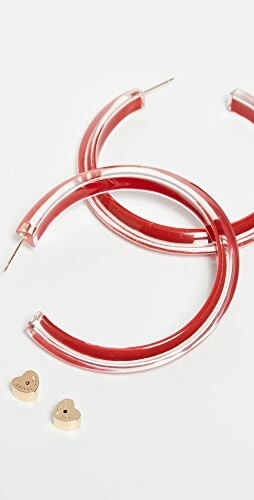 Comes in more colors. 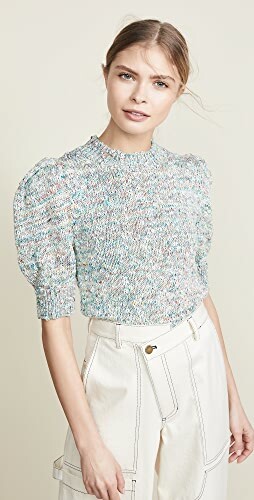 Cute sweater, the sides are open…and while it is not short I wish it was a tad longer. 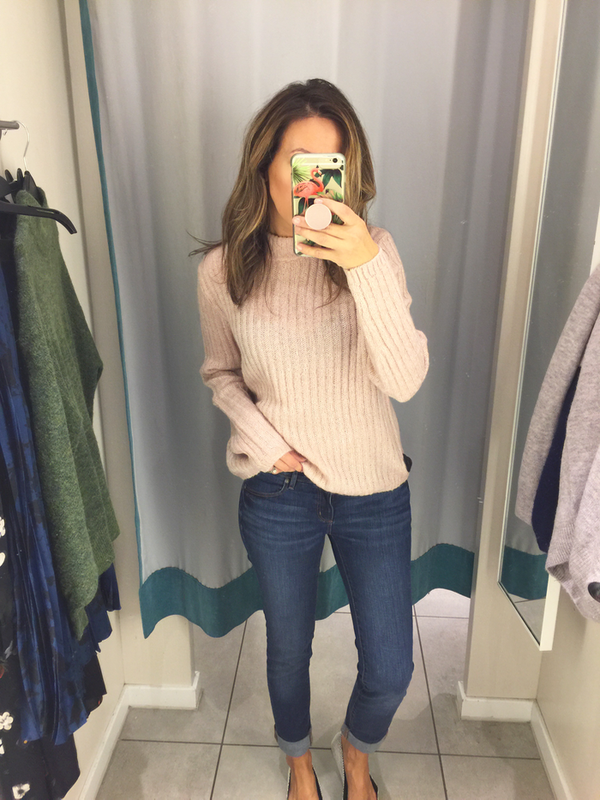 Did I even know how soft some of Madewell sweaters are? Apparently not! 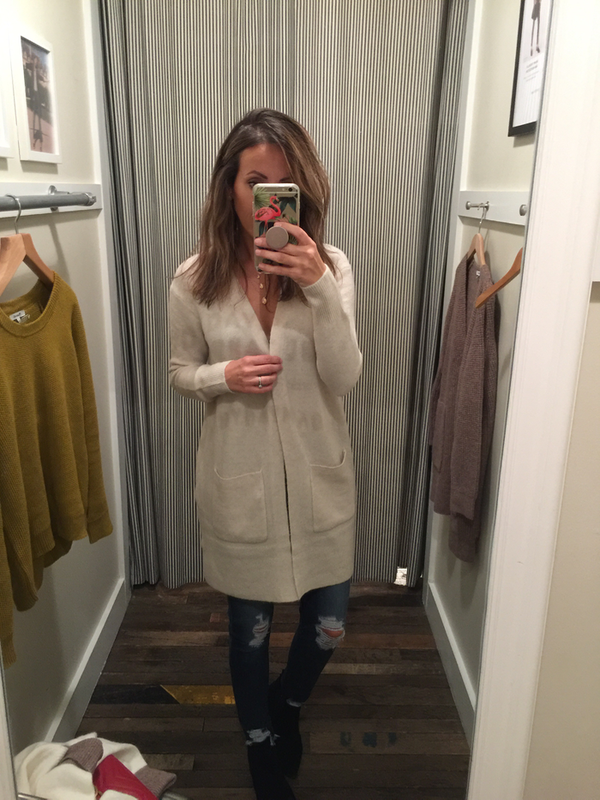 This first one was SO amazingly soft, it felt like cashmere…and I loved the thumbhole. Also comes in black. 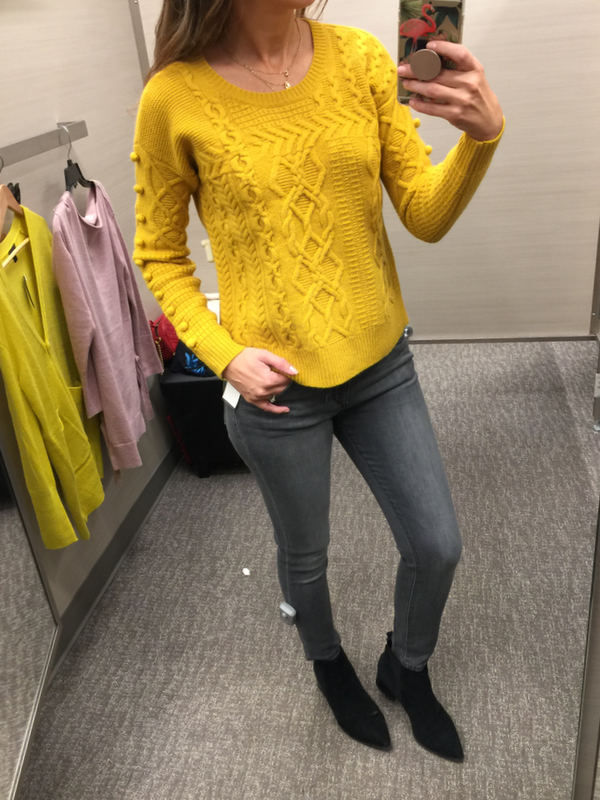 Cross-back sweater in xs (love the back detail and the color is quite nice). This cardigan was amazingly soft. 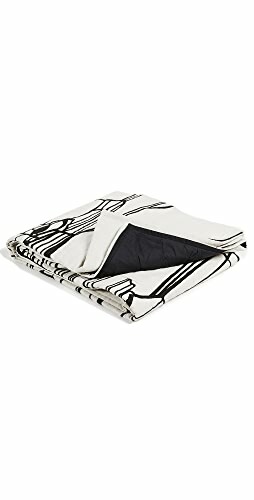 It comes in multiple colors but this was my personal favorite. 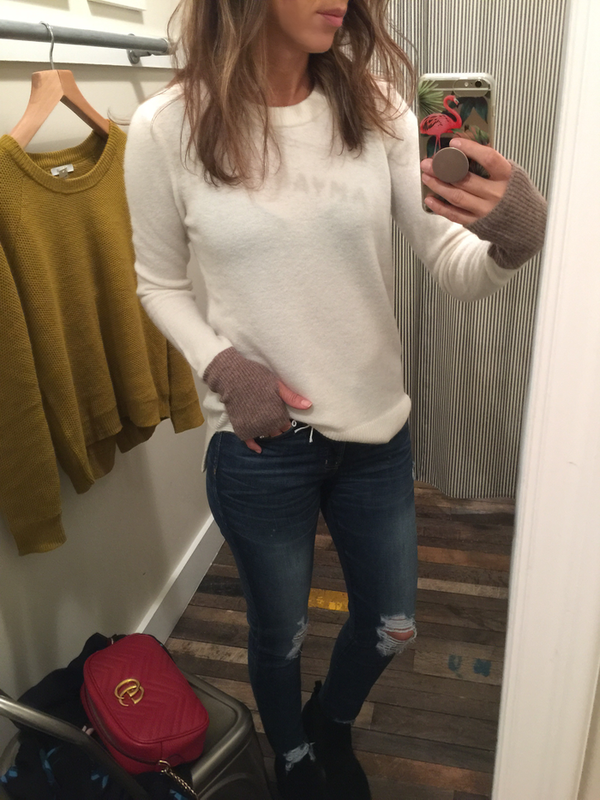 Basically loved all sweaters I tried on at Madewell. 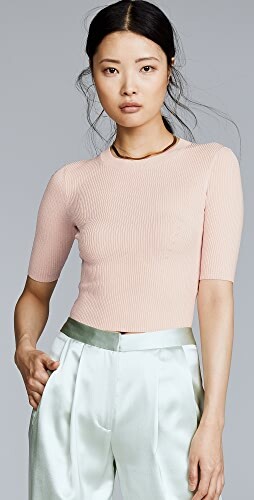 Waffle Stitch Cardigan in xs – really liked this color. 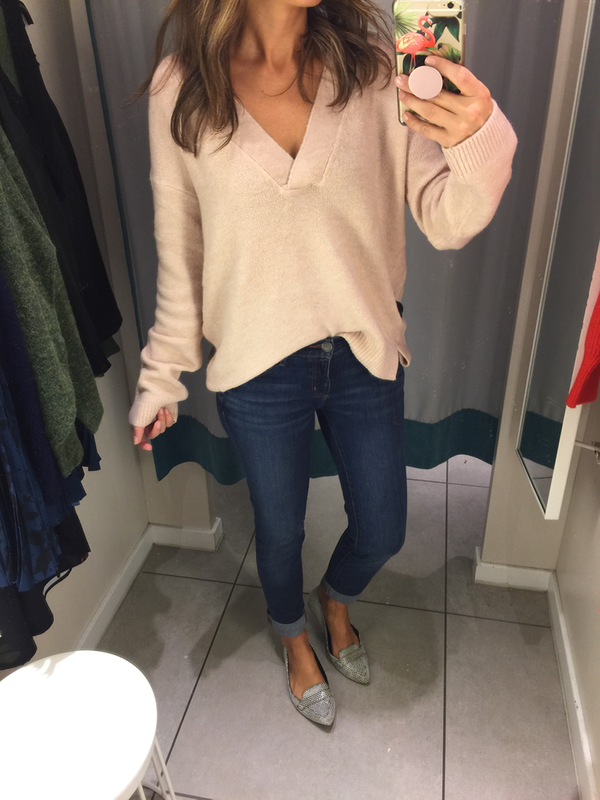 If you love oversized sweaters than look no further! H&M has a huge selection. And they’re oversized. I think I’ve tried on every single one in XS and most felt bigger than that. Some of these are no longer available online but it doesn’t mean they won’t get restocked. (did see this exact one…unless I missed it). 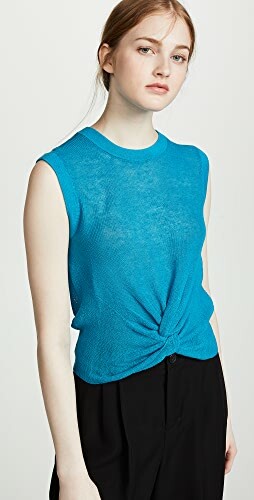 V neck sweater (in xs). 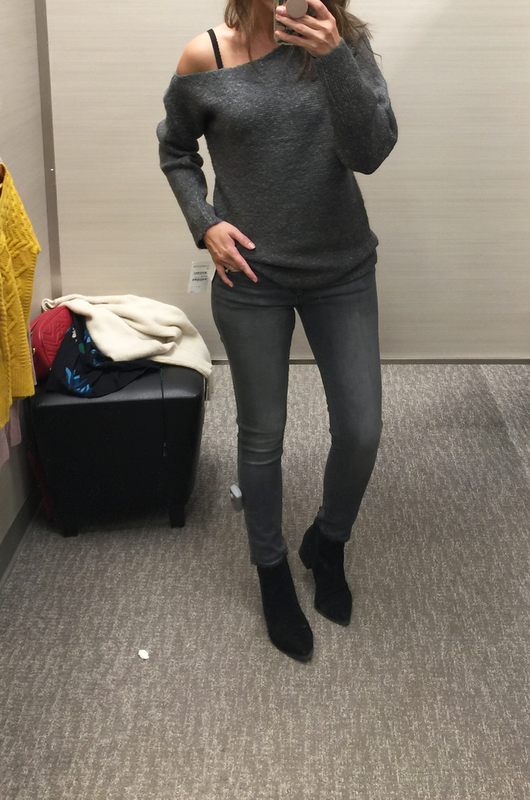 Here is the olive green sweater in to the left…forgot to take a picture of it on. 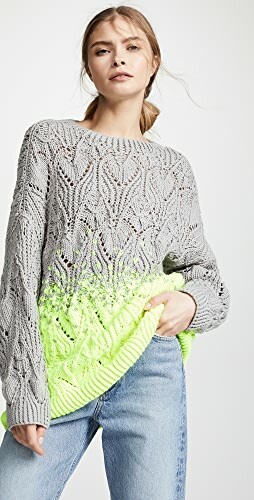 There are so many sweaters..can’t find this one..but…. 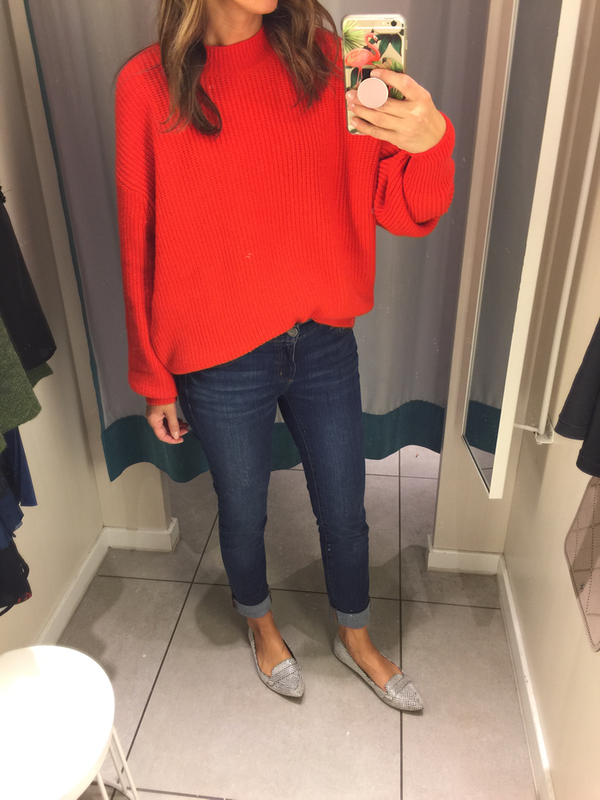 My jeans are from Loft, exact ones here (just cuffed more), and my shoes are from Topshop (a couple of years old). 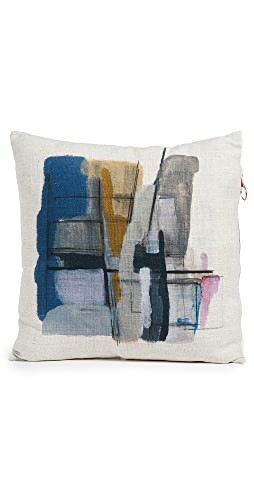 But loving these and these. 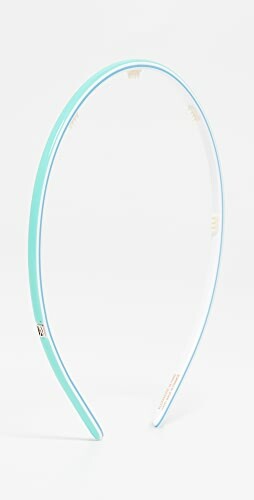 Anthropologie: 25% off Dresses and Jumpsuits, 20% off Tops, Sweaters and Jackets, and 15% off Bottoms. 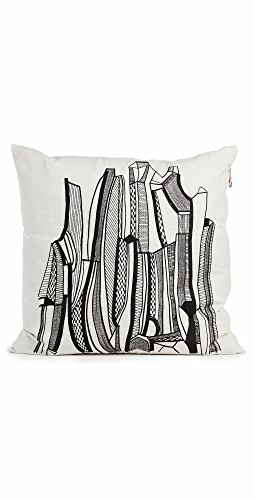 Horchow – up to 30& off ends tonight 10/13 (me basically drooling over their stuff). I’ve repurchased this Sheer Renewal Cream multiple times, I also love the Radiant Cleaning Balm (makes me feel like I’m at a spa, except I’m doing it myself haha) and I ordered this eye cream to give it a try. Previous Post White after Labor Day? 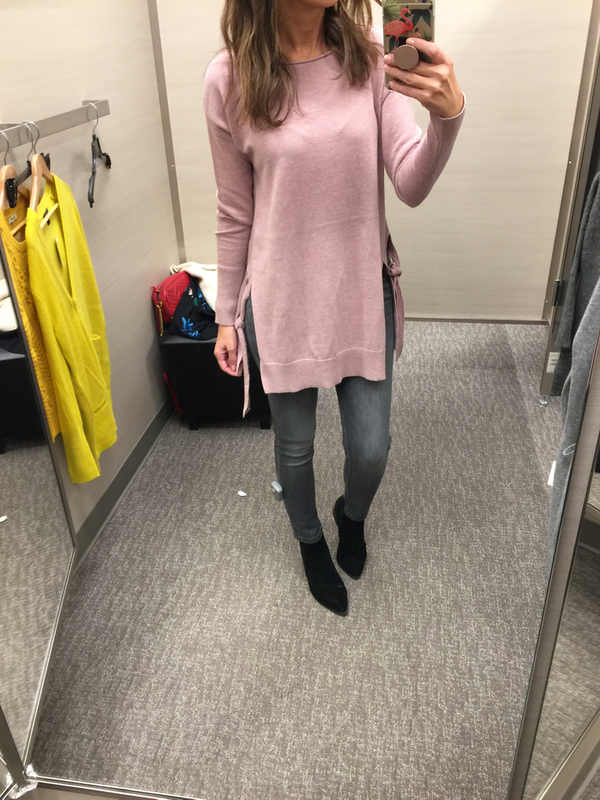 Your fitting room posts are my FAVORITE! So trendy & cute. Yes! 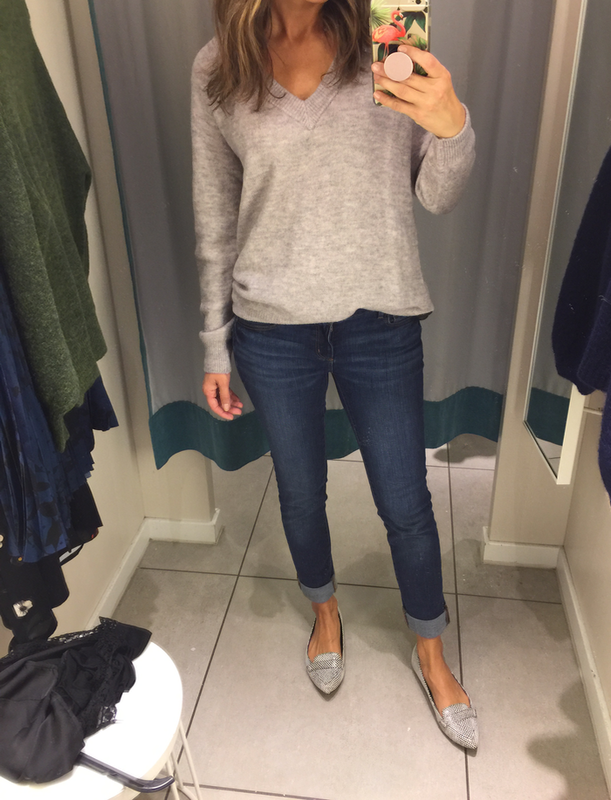 Loved everything you tried at Madewell, lovely colors, textures and fit is flattering! 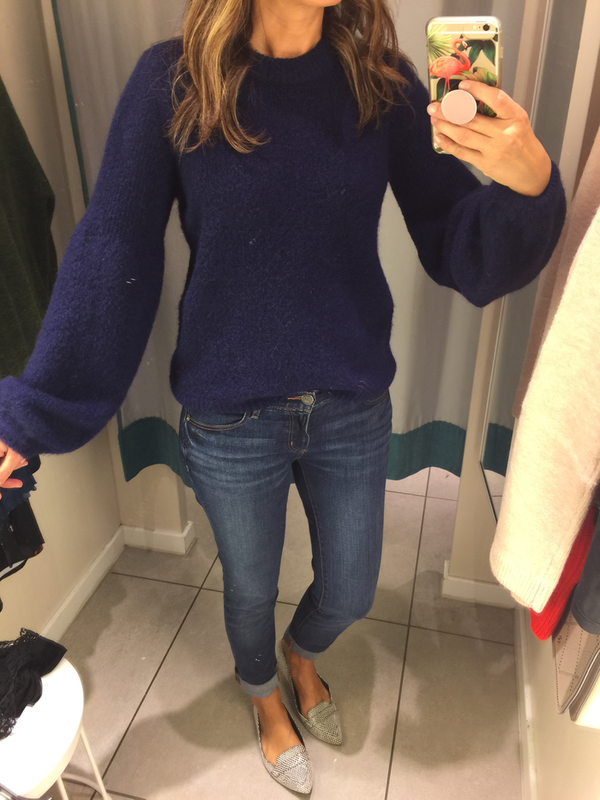 I've ordered (and returned) many oversized sweaters from H&M online, but always prefer to shop in store. Love all of their offerings this fall. I've kept a cardigan and an olive green sweater I think could be worn year round. I love the red one on you.Even though all of them are cute. 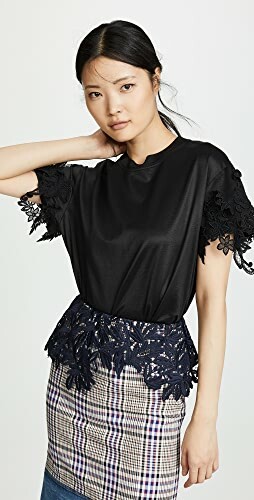 Shop Rebecca Taylor Blouses, Cutout Dresses, Black Gowns Dress, Black Pumps Heels and more. Get this widget.